Wavetable is a new synth that’s both intuitive to use and vastly capable. Stretch, shape and morph sounds into a broad sound palette using wavetables derived from synths, acoustic instruments, noise and much more. Start playing right away, or go deeper into sound design than you’ve ever been before. Live’s new device puts the power and palette of wavetable synthesizers into a software instrument that’s accessible and playful. It brings the deeper levels of sounds design within reach, without sacrificing the profound possibilities brought by this classic form of synthesis. 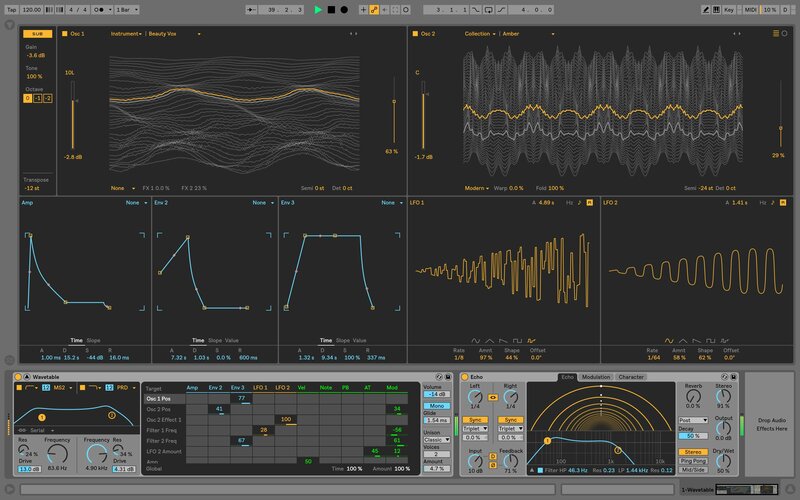 Behind Wavetable’s lavish sound are two main oscillators (plus a third sub oscillator) with which you can shape and morph hundreds of wavetables derived from classic, synthetic or real-instrument waveforms. Further richness comes from two morphable, flexible analog-modelled filters and a selection of unique unison modes. But it’s the accessible controls that really open up Wavetable’s possibilities. 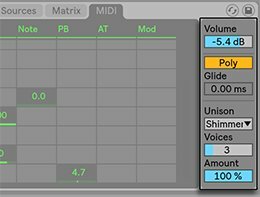 Click on almost any parameter and it will be added to the matrix as a modulation target, which you can then modulate with assignable envelopes and LFOs. What’s more, a full-screen breakout view means you can see all of Wavetable’s controls at once; so there’s no digging around in complex sub-menus – you can access everything immediately. A full breakout gives a clear overview of all controls and ample space for exploration. 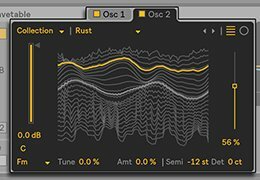 The oscillators offer more than 100 wavetables: classic synths, a range of acoustic instruments, harmonic tables, various types of noise and many more. Each oscillator has independent controls for pan, volume, and tuning, and a control to sweep through the position in the wavetable. A selection of oscillator effects, such as frequency modulation, phase distortion, pulse width, and oscillator sync, let you shape, stretch and morph each wavetable. Plus a sub oscillator offers a sine wave – with selectable octave and adjustable additional harmonics – for adding low-end presence. Two morphable oscillators with a huge collection of wavetables are supported by an additional sub oscillator. The filters that process the raw output of the oscillators offer analog warmth and flexibility for shaping and layering sounds. You can configure them in series, parallel, or in "split" mode – whereby each oscillator is sent through its own filter. Each filter can be switched between 12 and 24 dB slopes as well as a selection of analog-modeled circuit behaviors that emulate hardware filters found on some classic analog synthesizers. Two Cytomic-built, analog-modeled filters with a full range of filter shapes, drive and three routing options. The heart of Wavetable's sound design power is its responsive modulation matrix. Clicking on almost any control in Wavetable will add it to the matrix as a modulation target, where it can be modulated by three envelopes, two LFOs, and a variety of MIDI sources. 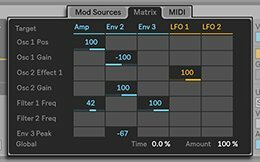 Quickly add modulation to the currently selected parameter using the modulation matrix. Sources include three built-in envelopes, two morphable LFOs and MIDI. The global section offers control over volume, toggling between monophonic and polyphonic playback and adjusting glide. And six different types of unison behavior provide some unique sound design possibilities for stereo widening, phasing and other chorus effects. Unique unison modes add width, shimmer, noise, randomness and more. Wavetable is the first synth that’s designed for deep sound sculpting from Push. You can easily assign sounds to the modulation matrix, letting you go in-depth right from Push’s controls. Plus you can see detailed wavetable visualisations so you can see what’s happening to your sounds right from Push’s display. Find out more about the history of wavetable synthesis and take an in-depth look at Wavetable on our blog. 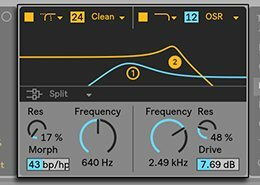 One of the most popular Max for Live devices, Robert Henke’s impressive Monolake Granulator has been updated for Live 9. Transform any sound with this versatile instrument. New from K-Devices, Terra is a polyphonic Max For Live synth incorporating frequency modulation, phase distortion, ring modulation and wave shaping. With its intuitive layout and characterful sound, it makes a unique and interesting addition to any musician or sound designer’s Live instrument arsenal. Combining the textural intricacy of FM with the freeform approach of a modular system, Bengal is a sound designer’s dream with its four operators, eight voices of polyphony, six audio effects and a flexible modulation architecture centred on an interactive virtual patchbay. Dark Synth is an highly innovative new Max for Live synthesizer that marries the vast possibilities of additive synthesis with a super-intuitive interface. As a great starting point for immersive sound-shaping, Dark Synth will introduce you to new horizons in sound design.